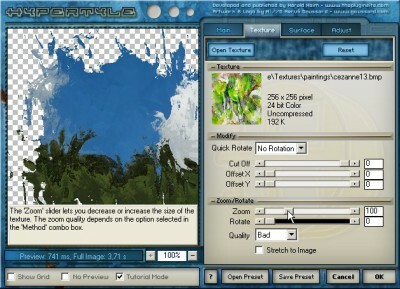 HyperTyle 1.0 is other software developed by The Plugin Site. HyperTyle is a sophisticated filter plugin for generating texture, surface, paint, erosion, transparency, edge, frame and shadow effects. These main effects are based on seamless textures, so there are unlimited variations possible. Additionally there are also zoom, rotation, metal, chrome, pop-art, warp, mirror, blur, noise, blending and other secondary effects which can be simultaneously applied to the seamless texture. other software is demo, which means you can download and use this limited edition of HyperTyle 1.0 for free. To use full version of HyperTyle 1.0 you have to buy the other product for $49.95. HyperTyle 1.0 is available at regnow and The Plugin Site website. HyperTyle 1.0 supports English interface languages and works with Windows 98/XP/Vista. We have tested HyperTyle 1.0 for spyware and adware modules. The software is absolutely safe to install. We has completely tested other software HyperTyle 1.0 many times, written and published the interesting article and uploaded installation file (3696K) to our fast server. Downloading HyperTyle 1.0 will take minute if you use fast ADSL connection. PhotoSurface is a Photoshop plug-in that will add a natural media texture to all your images.